We opened a musical last weekend. Considering that we met over the possibility of working on a musical together, it’s hard to believe it took 14 years for us to be working on the same show at the same time. But it isn’t always a straight line from idea to execution. The path that took us from that first meeting to last Friday’s opening performance is as twisty as a path can be. To be clear, the show we opened isn’t the show we first met to discuss working on; it’s also not the show we started discussing by text message in the middle of the night ten years after that (and which we still haven’t finished). It’s not a show either of us wrote at all. 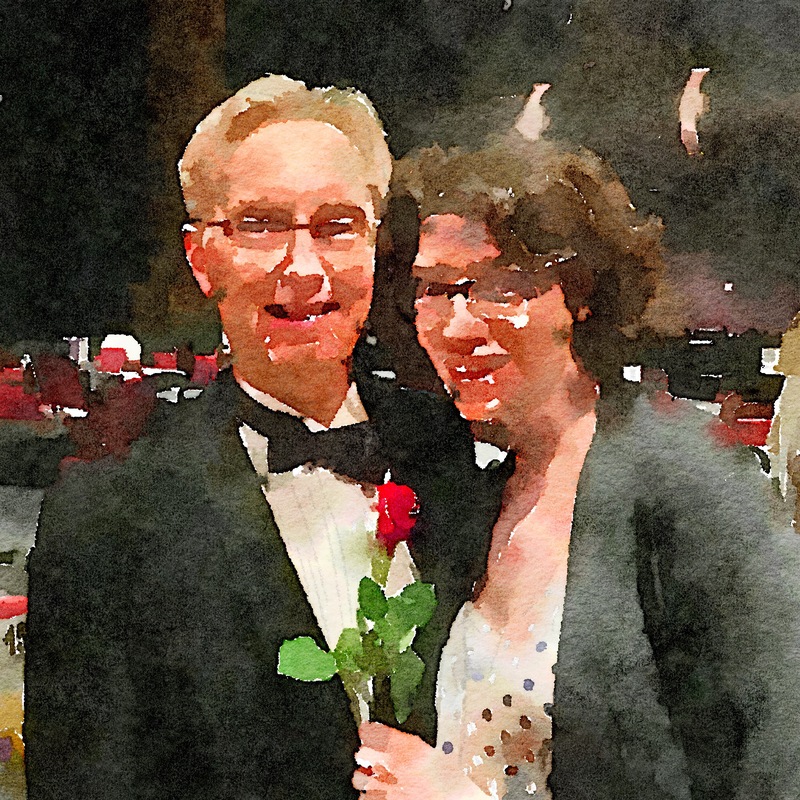 I’m the music director, and she’s a member of the cast. It’s been a long rehearsal process, and a very challenging one. It’s a very complicated show, and one that has been as full of frustrations as triumphal moments. And just when we felt like we’d gotten good at performing the show—in the rehearsal room, that is, with just a piano for accompaniment—it was time to move into the theatre and start adding the technical elements of the production: set, lighting, costumes, microphones, and the orchestra. We all know that each new element we add will cause something else to be a problem. The “real” set piece is harder to move than the folding table we used in rehearsal. Changing a costume takes longer than expected, and all of a sudden the actor misses a cue. Microphones don’t always work exactly as expected, so sometimes the conductor can’t hear a singer, and sometimes the cast can’t hear the band, and sometimes there’s shrieking feedback or a roar of a high note… In other words, it’s always something. Sometimes it’s many somethings at once. Sometimes it’s practically every something it can be. Yeah, that was our first night of technical rehearsal. We all try to be good-natured about it, but it’s immensely frustrating to feel like it was one step forward, a quarter-mile back. It wasn’t a total disaster, but nothing is perfect. We left the theatre disheartened, grumpy, and very hungry. “What’s even open at this hour?” she said, mournfully. It was a Monday night in the suburbs, and I couldn’t think of much except the drive-through window of a fast food place. Set to boil 2-1/2 cups water. Stir in the grits, add some salt. Reduce heat to low, cook for five minutes, stirring occasionally. Add the oil to a skillet over medium heat. While it gets hot, pull the tails off the shrimp and discard them. Cut the shrimp and asparagus into bite-size pieces. Slice the scallions and sauté the white parts, reserving the greens. Add the shrimp, sprinkle with paprika and cumin, toss to combine and sauté another minute or two. Add the asparagus, worcestershire, pepper sauce, and stock; stir to combine and reduce the stock a little. When the grits are cooked (but a little looser than usual, because of the extra water), stir in the cheese; the whole thing will thicken beautifully. 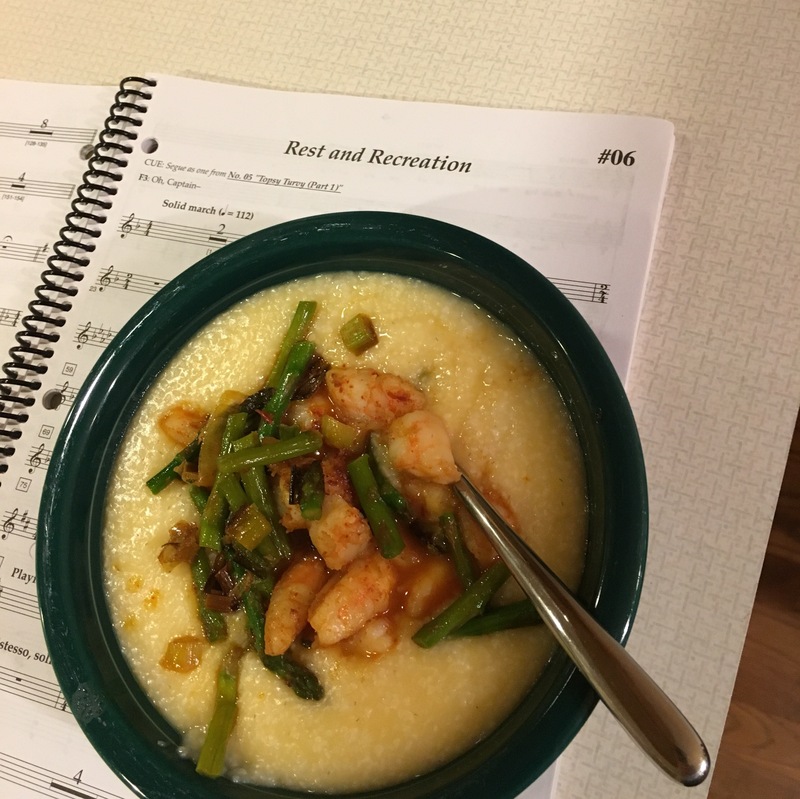 Ladle the cheesy grits into bowls, top with the shrimp and veg; top with scallion greens. Adjust seasoning to taste; if desired, add a bit more hot pepper sauce. 5 minutes. Serves 2, who will know that at least one thing went well tonight. Oh, sure, you could start with fresh shrimp, using the shells to make stock—but that would take longer, and after a night like this there’s no way you’d have the patience for that sort of thing. And if you’ve got leftover shrimp in the fridge, you really ought to use it. 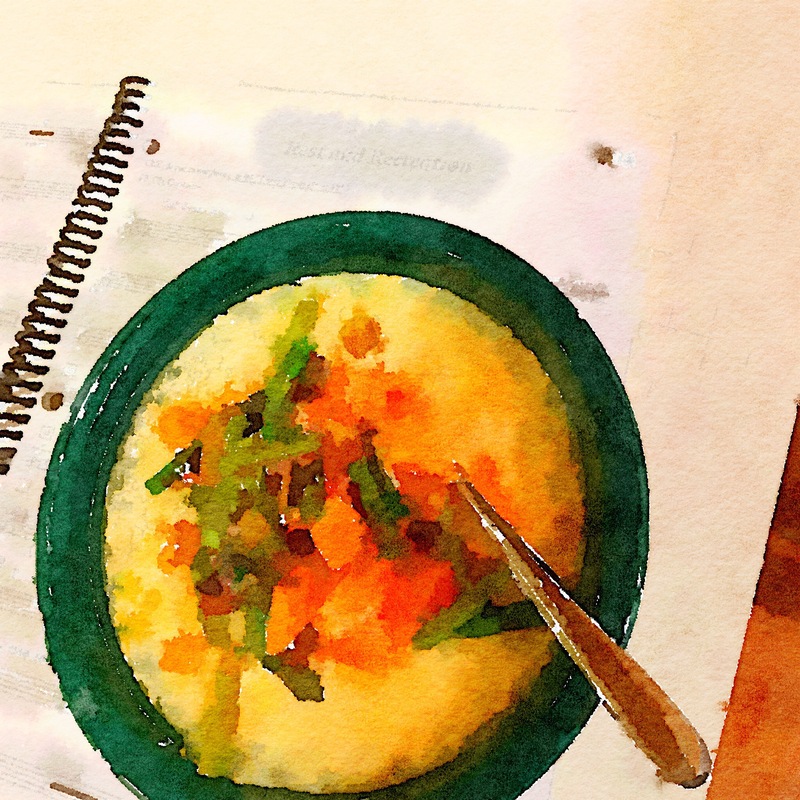 Purists will also grouse that asparagus has no business being in shrimp and grits. To such purists we say: pbbbbt. We like asparagus, we had some on hand that needed to get out of the crisper in time for Tuesday’s CSA delivery, and another vegetable in the dish made me feel less guilty about not serving a salad alongside. Why cut the shrimp into pieces first? Because when dinner is served this close to midnight you want it to be as easy to eat as possible. This entry was posted in Dinner, Uncategorized and tagged Dinner, Leftovers, Quick, Seafood, Theatre. Bookmark the permalink.